Hungarian main-line railways are operated by MÁV. There are three main railway termini in Budapest, Keleti (eastern), Nyugati (western), and Déli (southern), operating both domestic and international rail services. 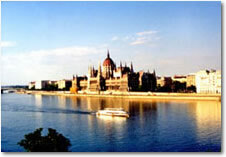 Budapest was one of the main stops of the Orient Express until 2001, when the service was cut back to Paris-Vienna. Board the blue and gold carriages of the Venice Simplon-Orient-Express in Budapest for your overnight journey to London. Enjoy the delightful cuisine and beautiful passing scenery as you travel towards Paris throughout the towering Austrian Alps and Swiss Mountains. After departing Paris, travel to the French coast for the Channel crossing. Board the gleaming carriages of the British Pullman for your journey through the Kentish countryside to your destination, London Victoria. The legendary Venice Simplon-Orient-Express awaits in Budapest for your overnight journey to Paris. Enjoy the delightful cuisine and beautiful passing scenery as you travel throughout the towering Austrian Alps and Swiss Mountains before a morning departure into the beautiful city of Paris.